It’s taper week in my household, but we’re still streaking! After logging my 1-mile run last night on Smashrun, I earned 5 badges. This is what makes running so fun! It’s all about the accomplishment and bling! And Smashrun gives you all kinds of incentives to just keep you going! 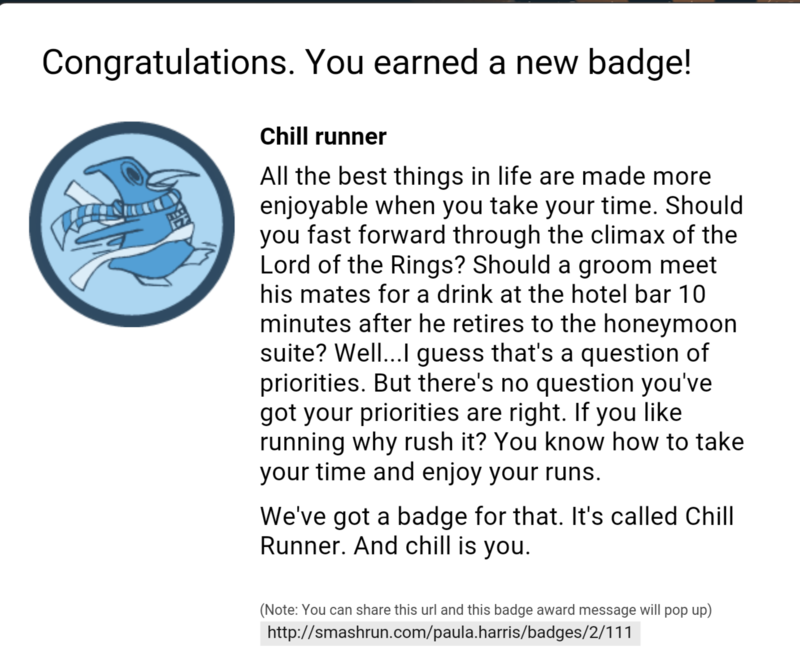 I have earned the “Chill Runner” badge! I love this! Everyone knows I’m not a fast runner, although I’m working on improving. In the meantime, I simply embrace the fact that I actually run period! What I love about this is the description of the “chill runner!” Because “I am chill.” Hahahaha! “I know how to take my time and enjoy my runs.” Yes! Amen! 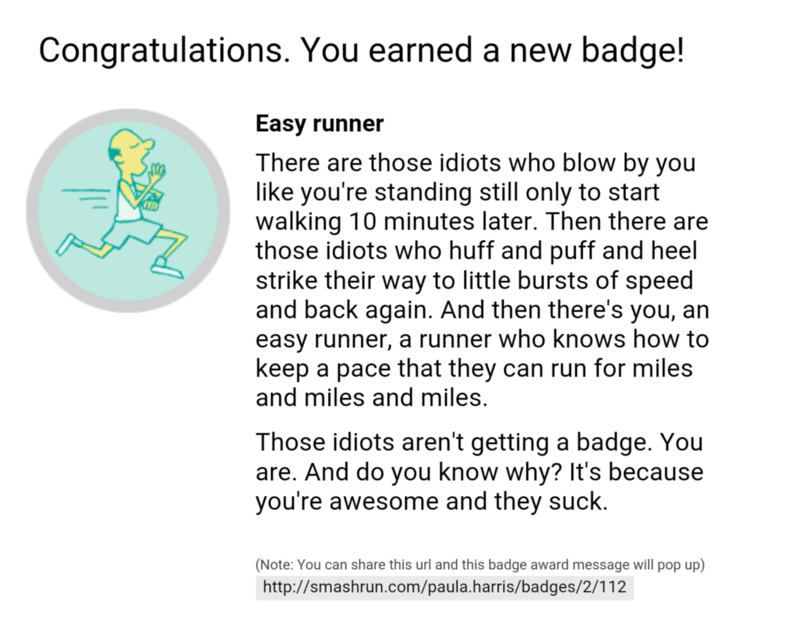 Another badge I earned was the “Easy Runner.” Again, read the description! What a brilliant way to encourage slower runners! Love! I laughed so hard and was so appreciative of this badge! The description sounds almost like the infamous Honey Badger! I love being associated with the Honey Badger’s attitude! Okay, there may actually be some hard-core runners out there who think that I’m disrespecting the sport by taking my slow running so light-hearted; not so. I’m slow, but I work hard at getting faster. It may take me six months to knock another minute off my pace or it may take me a year, but I’m okay with that because I’m faster than I was when I started this journey, and I plan on being faster next year at this time. When I’m 70, I’ll be the one crossing the finish line at the 100-mile Western States Endurance Run with only 5 seconds until cutoff. In the meantime, I love being a “Chill and Easy Runner.” Because that’s how I roll baby! This entry was posted in Training and tagged 13.1, blog, blogging, blogging101, creative writing, diet, fitness, Half Marathon, humor, life, marathon, Maui Oceanfront Marathon, Pacific Northwest, running, running slow, smashrun, training, weight loss, writing on January 12, 2016 by Paula. Smashrun looks cool but from what I can see it’s not compatible with FitBit. I’ll have to do a little more research on it. We easygoing runners need all the encouragement we can get. Those are so awesome…of course, I happened to be sitting right there when they popped up on your computer! Fabulous, and you are making fantastic progress, which we shall see again at the weekend! Doesn’t matter your speed- you are a runner and are getting out there. That’s what counts! Good luck this weekend! I may be slow, but it doesn’t mean I’m not trying! If you ever watch Spirit of the Marathon, John Bingham has a line in it about how you paid good money for this race & you want to get your money’s worth! I’ve never heard of SmashRun, but it sounds awesome! I’m going to have to play with it. I love that instant gratification–when my fitbit buzzes to let me know I’ve hit my daily steps I always do a little happy dance. It’s just too fun!! They have great rewards for even the smallest accomplishment! Love it!! Better than the average badge – a bit more fun!!! Well done on your running streak! ALL of this is awesome. I don’t think you’re a dishonor to the sport at all. In fact, you are a an honor! And you’re rocking that pace, and it will get faster, and even if it doesn’t that’s cool. Keep streaking, keep being cool! either way, I just wanted to clarify that I think you’re a great runner. You’re awesome Dorothea! Thank you!! :D. James was reading how “chill” of a race Maui is, so I’m going to fit right in! Chill… it’s my new word, hahahaha! On the contrary, I think you’re an inspiration for us non-runners to get out there and do what we can no matter what the pace or length. I love how honest you are about it. Who knows where you’ll be in a year? One things for sure, you’ll have your blog to see how far you’ve come! Congrats! You’ll be running long after most of the sprinters have blown out their knees. Excited to hear you’re going for 366 days in 2016. I’ve only ever run a 100 day streak. The funny thing was that when I finished it, and I finally had a day off, I expected I’d feel rested and have a bit more energy, but instead after skipping my run my legs felt worse, and I just felt so lethargic. Thank you!! And yes! That’s exactly how I feel! My legs stay much more limber when I actually use them!! I’m so honored you stopped by! Thank you so very much!! !